Every year, I am impacted (generally for good!) by countless people. 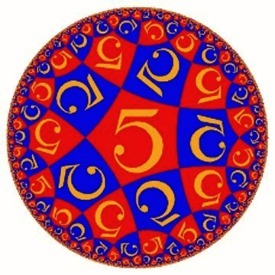 Some stand out in particular, however; and as I reflect back on 2010, my year-end post will be about a few of those very real people in my network who have inspired, connected, helped, and collaborated in remarkable ways this year. This spring, I was contacted out of the blue by Lisa Petrilli, a marketer from Chicago just getting immersed in social media. She simply reached out, and wanted to meet when I came to town…which we did. Not only has it been a privilege to be alongside as she launched her blog, but later in the year she came up with the idea of co-hosting LeadershipChat, which has been a real highlight of the last few months. Lisa has also proven to be wise adviser, a stalwart friend, and great connector with others. 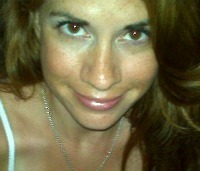 And, I constantly learn from her, whether she realizes it or not, especially in how she relates to people on-line. 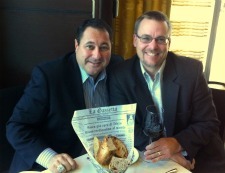 As I’ve contemplated (and even attempted, without success) a move back to Connecticut, I’ve enjoyed building up a growing network of Nutmeg State people via social networks, none more important than my friend Joe Cascio. 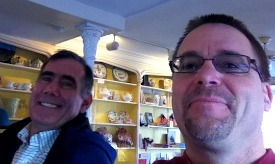 Joe understands what real people-networking is all about – whenever I’m going to be nearby (he lives near my mother-in-law’s town), he invites me to get together for coffee, and we brainstorm. And brainstorm. He’s a realistic revolutionary, a practical idealist, so we’re often on the same wavelength as we dream of new business ideas. He also put us in touch with a fabulous realtor in the area, and along with Betsy Raymond Stevenson, we hope to spend lots more time in the future growing a network in the SE corner of CT! Amy Fitch is a full-time Mom, full-time businesswoman, full-time networker, full-time visionary, who currently resides with her adorable tribe of redheads in northern Vermont. After years of exchanging 140-character messages via Twitter, I had the chance to finally meet Amy and her family this year, as my wife and one of my sons were traveling through and had an invite to spend a day and night at the Full-Time House. During that lovely day in Burlington, I also got to spend more time with Rich Nadworny, who subsequently sent some unexpected business my way (thanks, Rich!) Amy is one of those energetic and savvy younger gals who, like Kirsten Wright and Sarah Evans and many others, give me hope for the future. Manny Hernandez and Kerri Sparling have been my two sherpas into the world of people with diabetes. These two very active blogger/networkers have allowed me to gain insights into the world of people dealing with long-standing disease by befriending me and opening up their lives and welcoming me in. They are two of my favorite ePatients and, along with Dave deBronkart (get his book: Laugh, Sing, and Eat Like a Pig!) have given me unique perspectives into the “other side” of the healthcare world – regular people/patients. All three of these folks are also incredibly bright and funny. And Kerri’s daughter is a doll! 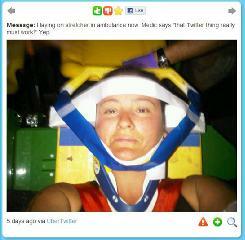 I was unexpectedly drawn into an unfolding on-line drama when Leigh Fazzina tweeted for help after a bicycle accident in the woods. The awesome power of a Twitter network was brought front-and-center as an ad-hoc, global, virtual support group formed within minutes to help get the seriously injured Leigh found and rescued by local emergency personnel. It actually didn’t seem like that big a deal until it was over; the event got picked up by local and national media and even made Twitter’s list of Top 10 tweets of 2010. Irony – although we’re just a few hours apart, Leigh and I STILL haven’t met face-to-face after years of being acquainted on-line. Maybe 2011, Leigh? The LeadershipChat crew. This lively bunch, gathering on Tuesday nights to discuss leadership topics, was a totally unexpected bonus of 2010. It even led to a spur-of-the-moment lunch meeting with chat participant Lou Imbriano, who saw via Twitter that I was heading on the train up to Boston and invited me to a wonderful time feasting and gabbing over a real Italian lunch. Since I can’t list out all the quality folks that I’m getting to know at LC, I simply invite you to join us (8 PM ET Tuesday nights) and have a seat at the table with the fun little community that’s forming. 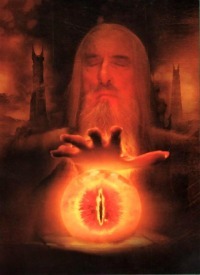 My Inner Circle. You know who you are. Your counsel and feedback and encouragement are priceless. Now, for the best part – I’m guessing this list will be quite a bit longer for 2011. Looking forward to a great year connecting and chatting and scheming and brainstorming and pushing the boundaries with more of you in the coming year! This morning, I just finished a post on when things don’t “just work”. Then I downloaded the new version of Skype for the iPhone, which includes the ability to do video calls with other Skype users. 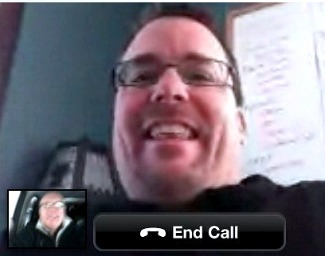 Jim Long (@newmediajim on Twitter) wanted to test it out also, so we had our first real-time conversation via iPhone-to-iPhone Skype video. Jim on a 3G network, and me from my home Wi-Fi. It. Just. Worked. As with Skype on the computer, this was a totally intuitive process, and we connected right up and started chatting without a flaw or hiccup. Call me impressed. This may very well catalyze a changeover for me from casual (but happy) Skype user to a paid, heavy-use account. If you haven’t tried it, give it a whirl. The future keeps arriving in the palm of our hands. We came back home after a few days away to a rather amusing note from the gal who house-sat out home (and dog) while we visited family over the holidays. The atomic-interfaced alarm clock is now into 2017. 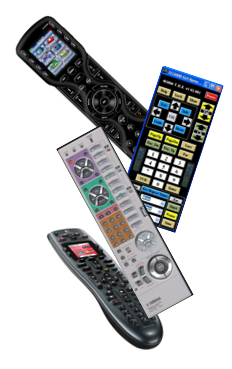 Anyone who, like us, has more modern digital video/sound systems knows the problem with the proliferation of remote controls and the occasional complexity of doing simple tasks, like, say, turning the thing on and changing channels. What if the prior input was for the Tivo, and now I want to watch a broadcast channel, or a DVD, or skate on over to Netflix-on-demand? Eventually, you get used to which buttons to press and in what order, but when someone else comes into the house, you now have…utter confusion. Back in the day, when you walked into someone else’s house, every TV pretty much worked the same. And radios had on-off buttons and simple station selectors. It wasn’t HD, but it was simple. It worked. But we’re not there yet. When a house-sitter can’t even get a TV to work, we have a user-interface problem. When I STILL need my kids to occasionally remind me that I have to press button Q on remote #3 in order to actually reach the proper menu to do X, this is not good design. We’ve crossed the threshold of easy on a lot of products and systems, but we still have a ways to go to make everything just work. I guess that’ll keep some of our talented people permanently employed! A growing group of thinkers/doers has been gathering on Tuesday evenings (8 pm ET) for a weekly event called #LeadershipChat. We gather around a virtual table on Twitter and discuss various topics around leadership in business. And in a relatively short 2 months, quite an energized group of attendees have chosen to spend that hour together – an hour that flies by faster than any other in the week. So why will you love #LeadershipChat when you join in? Here are 5 simple reasons. LeadershipChat is warm. One of the first things you’ll notice is the friendly and welcoming climate. LC is designed to be like a Tuscan dinner table, and you can’t help but enjoy the banter and feel the love (yes, I said love). Smart people congregate there. I’ve tuned into other chats, with plenty of smart folks as well, but you’ll find a concentration of sharp thinkers at LeadershipChat who challenge our ideas quite regularly, in 140 characters. You will find lots of new people to follow. Already, in a few weeks, we’ve seen a growing network of people discovering each other through LeadershipChat, some of whom are already communicating and collaborating outside of the weekly event. While the topics are both practical and sometimes even edgy, we have an awful lot of fun each week – before, during, and after LeadershipChat. 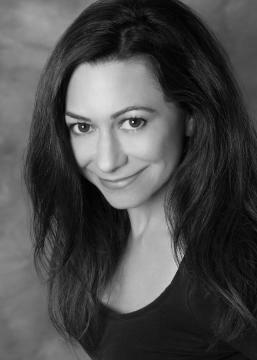 Lisa Petrilli is one of the co-moderators. Enough said. So, if you haven’t yet taken a seat at the table, please join us. Tonight, Tuesday December 21 is an “Open Mic” night, so any topic of interest to you can be placed on the table (hint: one very easy way to participate is by using a client like Tweetchat. Just log in, read the stream of thoughts that are being shared, and feel free to chime in with your reactions and questions.). I don’t usually do year-end prediction posts, but after reading so many enlightening missives from brilliant thinkers, I was hit by a sudden flash of inspiration – a massive and luminous outpouring of the blindingly obvious. 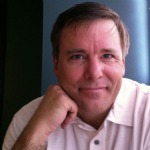 So, here goes – my can’t miss social media marketing predictions for 2011. More people will search for stuff on-line in 2011. It’s been growing every year for quite a while now, and the big surprise is, that this behavior will continue to occur. Mobile is going to be big. Really big. E-commerce will explode onto the scene. As people discover that they can buy things on-line, they will do more of it. Books, music, toys, pet food – you name it. Disintermediation is the key word here. Big for 2011. Apple will introduce flashy new versions of its hardware and software products. And people will buy them. In fact, some people will wait in long lines to buy them – and others won’t. A lot of people will do a lot of stuff on Facebook, which will have more users in 2011 than it has now in 2010. Very important people will be profoundly embarrassed by revelations made about them via the Internet. Market valuations for software vendors will go up and down while fluctuating during the year. Companies will try to sell stuff using social media, and social media purists will be so upset about it, they’ll whine on Twitter and blogs. Everyone will hate SxSW’s method of choosing panels by popularity contest, but a million bloggers will beg for votes on Twitter anyway, while saying how much they despise doing so. People will discover that if you join smartphones with location apps with coupons you can cause a lot of people to make a lot of noise on-line about it, and generate stoopid company valuations. What about you? What are your profoundly insightful predictions for the exciting year ahead? We get so used to the list of roles/titles/accomplishments/awards on a resume, that it can blind us to what really matters, at least when it comes to those being entrusted with leadership. Let’s start asking this: Where’s your following? Gradually over time, America has become overly obsessed about managing tasks. 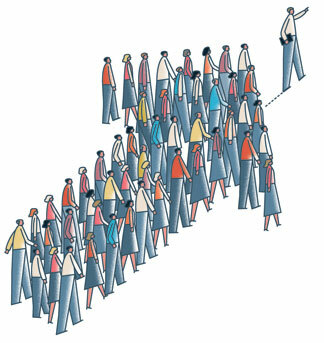 In our quest to produce results, we have lost sight of the importance of engaging people. As human beings we have emotions. We have hopes and dreams. We have a conscience. We want to be respected, to be recognized for our talents, to belong, to have autonomy or control over our work and our lives, to experience personal growth, and to do work that we believe is worthwhile and in a way that we feel is ethical. It’s how we are wired. When we work in an environment that recognizes these realities of our human nature, we thrive. We feel more energetic, more optimistic, and more fully alive. When we work in an environment that fails to recognize these realities, it affects our ability to become engaged and deliver sustainable results. It’s also damaging to our mental and physical health. All the Six-Sigma, Lean, benchmarking and metrics in the world won’t help us lead people if we fail to recognize these realities. Leadership is all about the human experience. So, if someone is a true leader, it should be evident in multiple spheres of life. Where are your followers? And – very important – how are they doing? The measure of a good doctor isn’t the number of degrees posted on the wall, or the rich appointments of the office. It’s the health of his patients. Maybe the new job posting should be: WANTED – Great Leader. 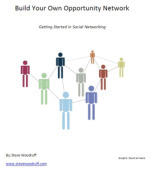 Key Qualification – Thriving Followers. While “past performance is no guarantee of future results,” when it comes to leadership, it’s probably a pretty darn good indicator! It’s an (unfortunately) common and disheartening reality for many talented and driven professionals. So, what do you do when it seems that corporate control and fragile management egos trump your ability to develop into a leader? Do you stay and work for change? Hold out sullenly until something better comes along? Or just leave? 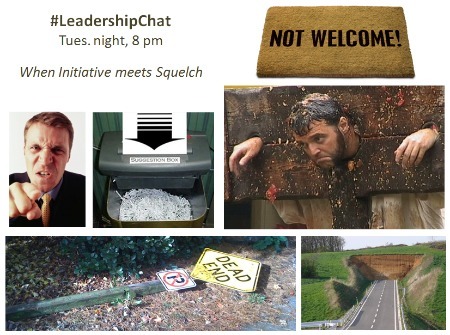 At Leadership Chat this Tuesday night, we’ll be talking about what happens when initiative meets squelch. 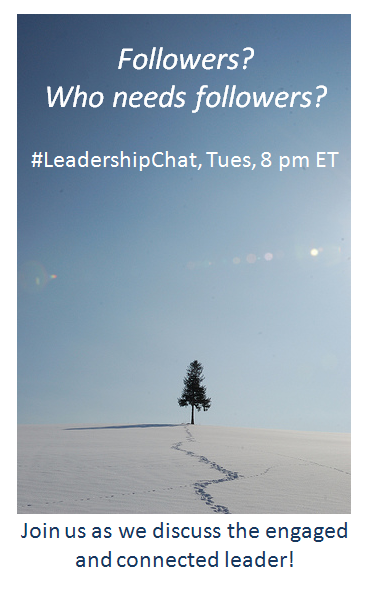 Join us on Twitter at 8 pm ET (hashtag: #LeadershipChat) and let’s discuss this all-too-common dilemma! And before you pull up a seat at the table, be sure to read the perspectives of my lovely and talented co-host, Lisa Petrilli, which will be published on her blog Tuesday morning!